Looking for a winery when you visit the mountains of North Carolina? The Asheville region has plenty of wineries, each with its own distinct flair. Biltmore Estate’s winery has been in operation since the mid-1970s. Our favorite Biltmore wines are the Chenin Blanc, Pinot Noir, Sangiovese, and Limited Release Malbec. You need a Biltmore Estate admission ticket to access the winery on the estate; complimentary wine tastings are included in the price of admission. Biltmore wines can also be purchased at local wine markets and stores. Burntshirt Vineyards crafts its award-winning wines from 100% estate-grown fruit, and the wine is produced and bottled onsite. Tastings and tours are available at the winery. There is also a nice picnic area. Burntshirt counts among its many wines a Merlot, a Cabernet Franc, two Chardonnays, and a Grüner Veltliner. Located on 10 acres, the family-owned Saint Paul Mountain Vineyards has14 varieties of wine grapevines growing on two vineyards, and employs a full-time winemaker. 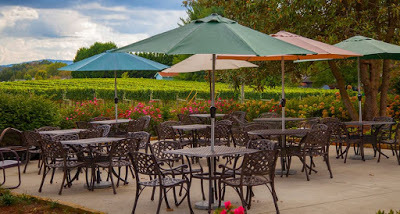 The winery has been open to the public since 2012, and the tasting room at the winery is open year-round. Wines include a semi-sweet Riesling blend and a Chardonnay, as well as four different varieties of red wine. About 17 miles north of Asheville is Addison Farms, a family owned and operated winery, vineyards and tasting room. The winery has nearly 360-degree views of the Blue Ridge Mountains and great wines, including Cabernet Sauvignon, Cabernet Franc, Sangiovese, and Montepulciano. Belle Nicho Winery at Howling Dog Farm specializes in native and French American hybrid vines. This small farmstead winery uses organic practices to grow its grapes, and was awarded NC Green Travel recognition by the Department of Environmental and Natural Resources The winery is open just before Valentine’s Day every year and stays open through New Year’s. With a beautiful tasting room that opens up to a patio with equally-beautiful views of the mountains, Silver Fork Winery is a guest favorite. You can take a tour of the winery and vineyards, or relax with a picnic lunch. Wines include Chardonnay, Cabernet Franc, Cabernet Sauvignon, Merlot, and more. Silver Fork Winery is also pet friendly. 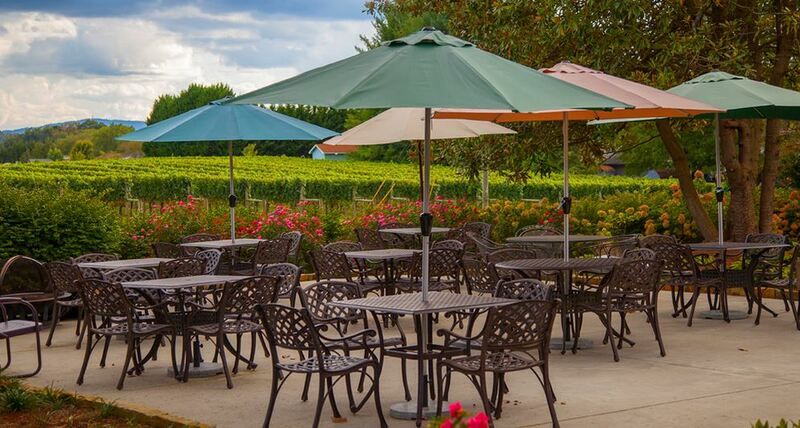 South Creek Vineyards and Winery is set on a gorgeous piece of property in Nebo. Their award-winning Bordeaux style wines can be sampled in the tasting room at the winery. South Creek often has live music as well on the patio of an Italian Renaissance farmhouse that is over 100 years old. South Creek Winery is pet friendly. If you’re headed north on Hwy 221 to the Blue Ridge Parkway, Linville Falls or Grandfather Mountain from the Inn on Mill Creek B&B, consider a stop at the award-winning Linville Falls Winery. Located just a quarter mile south of the Blue Ridge Parkway, Linville Falls Winery’s tasting room is open from 12pm-6pm. There are even hiking trails on the 40-acre farm. In addition to the area’s wineries, two excellent locally-owned wine markets are located in Black Mountain, just 10-15 minutes from the Inn on Mill Creek B&B, and both offer great wine selections and tastings: Artisan Gourmet Market and Merry Wine Market. And if that isn’t enough of the good stuff, there are bus tours that take visitors on tours of select wineries. 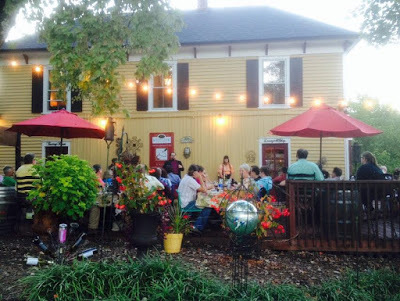 French Broad Vignerons follows three “wine trails” — the Catawba Valley Wine Trail, the Elevations Wine Trail, and the Gourmet Wine Trail. See more details at http://frenchbroadvignerons.org/wine-toursbus. This entry was posted in Local Food and Drink and tagged food and drink, wineries by Inn on Mill Creek. Bookmark the permalink.